Depending upon your point of view, the Sisters of Charity founder is either Saint Vincent de Paul or Saint Louise de Marillac. Both saints are honored by the international Sisters of Charity as the founders of this major group in the Roman Catholic Church. 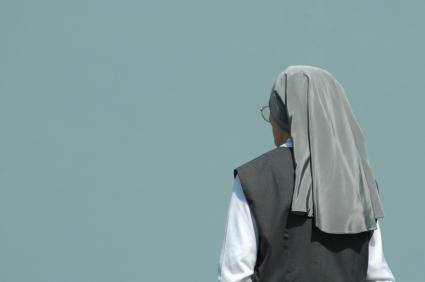 The Sisters of Charity, or the Sisters of Charity of Saint Vincent de Paul, is a Roman Catholic order of nuns devoted to carrying out Jesus' call to mercy and kindness to the less fortunate. Among the many Catholic orders devoted to care of the poor and sick, the Sisters of Charity are often the most recognizable. They are also sometimes called the "Gray Sisters" because they wear a blue-gray colored habit (long dress and veil), although they may also wear modern plain clothing, scrubs or nursing uniforms, depending upon their work. They may also be referred to as the Daughters of Charity, a name which St. Vincent de Paul himself was said to have preferred. Their lives, hearts and prayers are devoted to caring for those who cannot care for themselves. In the turbulent 1600's Paris was a thriving metropolis, but it was also teeming with the poor, the sick, and the indigent. A parish priest named Vincent de Paul, who was eventually honored with sainthood, heard the cries of the poor, and organized a group within the parish to respond to the needs. In 1617, the group, known as the Association of the Ladies of Charity, enlisted the help of noble women to give aid to the poor. As the movement grew and more and more women volunteered their time and help, Saint Vincent asked his friend and fellow worker, Louise de Marillac, to instruct the young women in both their duties to the poor and in faith. Over time this group of women became the first congregation of the Sisters of Charity. Nearly 20,000 sisters live in 2,300 communities found in 91 countries around the world. These sisters work in a variety of settings, from hospitals and nursing homes to homeless shelters. They also serve migrant workers in various countries, minister to those in prison, and care for children and teens. Wherever they are, they bring hope, peace and practical comfort to all those in their care. Two people are honored as the Sisters of Charity founder: Saint Vincent de Paul and Saint Louise de Marillac. Saint Vincent de Paul (1581-1660) was a French priest who is recognized as one of the co-founders of the Sisters of Charity. After studying theology, he was traveling to Marseille when he was captured by pirates. He was sold into slavery in Tunis, but eventually converted his slave master to Christianity and regained his freedom. When Vincent returned to France, he began his work as a parish priest in Paris. He was horrified at the number of babies left on the steps of Notre Dame Cathedral. Whether these babies were illegitimate or the children of families too poor to care for them, he was so upset that he eventually created a home to raise these children. This amazing man went on to a lifetime of serving the poor wherever he encountered them. It was this devotion to caring for the less fortunate that inspired him to organize a group of women within his parish to care for the local poor. These ladies eventually became the first group of the Sisters of Charity. Many Americans know his name through St. Vincent de Paul centers, similar to Goodwill centers, that sell donated items or give items directly to the poor. Louise de Marillac (1591-1660) led a fascinating life. She was an illegitimate child and never knew who her mother was, but her father, an aristocrat named Louis de Marillac, acknowledged her as his child. She had a strong religious calling her entire life and wanted to enter a convent. No one knows for sure why she wasn't accepted into the convent, but some speculate it was through her aristocratic father's machinations that she eventually wed Antony de Gras. De Gras himself had a high position at court as the Secretary to the Queen Mother. Even though she was married and had a child, Louise de Marillac did not spend all her time in her lavish homes in France. Like Princess Diana, Louise devoted her time to good works and charities. She was a follower of St. Vincent de Paul, and helped him with his new group of people who were directly working with the poor in the rural areas near Paris. Eventually, Saint Vincent de Paul asked Louise to take over the education of the girls and women who wished to join the group. In 1655, the Vatican approved the Sisters of Charity order, and Louise was then able to get her wish and take her vows as a nun. She remained the head of the order, or Mother Superior, until she died in 1660. By the time she died, the Sisters of Charity had spread into 40 communities. Louise de Marillac became an official Roman Catholic saint on March 11, 1934 and is known as the patron saint of social workers. The Sisters of Charity give their lives in service to others as a way of expressing their religious devotion. They offer their ministrations without regard to race, religion or creed wherever there is a need. From their healthcare ministries to their education programs to their social welfare ministries for the elderly and poor, these devoted sisters are a conduit of God's mercy and grace to others.